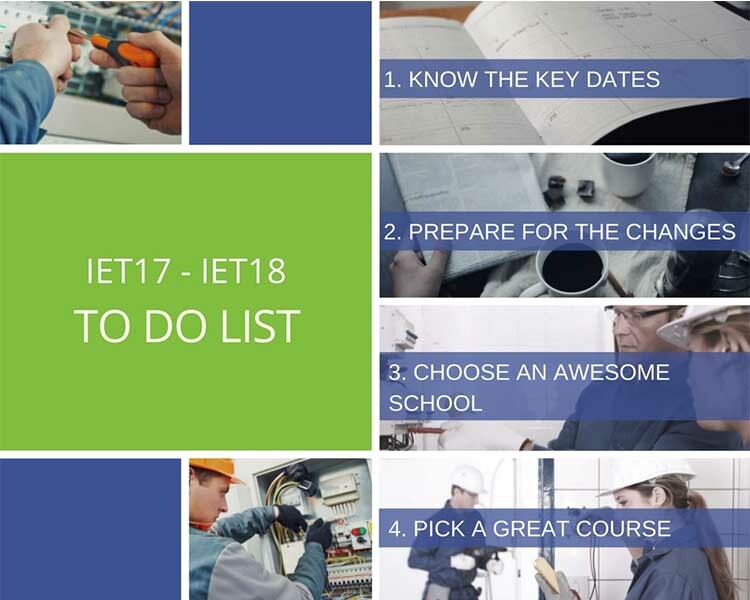 Are You Ready for IET18? Electrical engineers and electricians must work to BS 7671, the British Standard for wiring regulations. The 17th edition provides the set of national standards with which all UK home and industrial wiring must comply. The 18th edition of the wiring regulations has been under preparation, and the draft updated standard was published for review and consultation in mid-2017. The final version is due to be published on the 1st July 2018. The latest changes will mean that electricians currently working will need to update their qualifications. Those qualifying for the first time will study the 18th edition (IET 18) from 1st July 2018. Below, we describe some of the main changes being suggested. The current clause 433 is likely to be changed in the light of updates by the International Electro-technical Committee (IEC) and the European Committee for Electrotechnical Standardisation (CENELEC). The proposed change concerns the AQ criteria focusing on the conditions of external influence for lightning, which are used to decide whether protection against transient overvoltage, such as lightning, is needed. In other situations, a risk assessment would be used to identify whether protection is needed. Without a risk assessment specifically stating that it is not necessary, then protection will need to be installed. An exception is a single dwelling unit, as this involves calculating the costs of the electrical installation. However, switching overvoltages still needs to be considered and protection may be necessary. The current regulations state that people, livestock and property must be protected against a fire caused by an electrical installation or equipment. Protection against burns and overheating is necessary, and specific fire risks should be taken into account. Residual current devices (RCDs) can cut the number of fires caused by earth faults. However, they won’t cut the risk of fire where parallel or series arcing occurs between live conductors, as there is no leaking to earth. Another problem is that the current can be below the threshold of the circuit breaker as a series arc fault’s impedance reduces the load current. So, the 18th edition is likely to contain details of how to install arc fault detection devices (AFDDs). These devices will cut the risk of fire caused by arc fault currents in final circuits of an installation. In the 18th edition, this section also is also likely to cover embedded heating systems, both indoors and outdoors. This includes a wide range of installations, such as wall and floor installations, and heating systems in any other part of a building. It will also encompass embedded anti-frost and ice systems such as those in lawns and football pitches. However, it doesn’t cover systems that comply with IEC 60519 or 62395. Designers will need to provide more documentation on the materials being used around heating units. Walls are prone to penetration, so there are extra requirements to prevent short circuits between live conductors that could cause overheating. Where a product doesn’t have an earthed conductive shield then one will need to be provided and connected to the electrical installation’s protective conductor. The client will be able to specify the level of energy efficiency that the electrical installation must achieve. Energy efficiency performance may also be scored; for example, points might be awarded for transformer efficiency. An entire installation might also be scored, so that the installation would receive an efficiency rating from EIEC0 to EIEC4, depending on how well it performs in tests. There may also be potential changes to the power supply for electric cars, electrical installations on campsites, and updates to switching and isolation standards for devices. 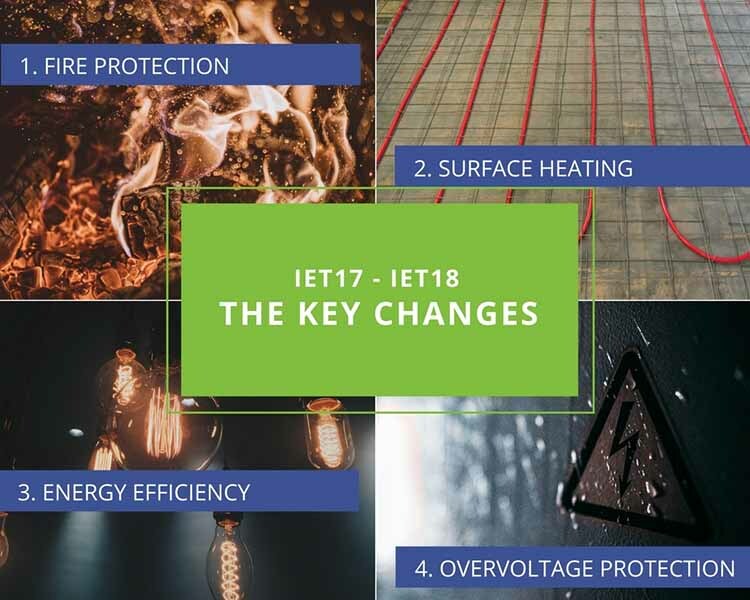 In general, the 18th edition proposals have been met with some criticism from electrical installation businesses, and these businesses will have been feeding back their comments on the changes. The new standards make clear that electricians may need to be more involved with the whole design process for the installation, which is potentially time consuming. The RCD changes will affect consumer units, and changes to TNCS earthing and cable sizing will affect building designs for new builds, increasing the complexity of the process. As for the energy efficiency standards, as always, there will be a trade-off, with very efficient systems probably initially costing more. At Logic4training we understand the importance of being ready when big changes to advice, rules and regulations change throughout the years. We’ve put together a simple action plan you can follow to ensure you are prepared for the changes. Logic4training has already begun preparation for its training courses, although they will only be available once the full guidelines are published in mid-2018, allowing you to be prepared in time for the January 2019 when the regulations kick in. The 18th edition will be in place from the 1st January 2019 and everyone who works in the electrical sector will be expected to update to the new edition promptly. Many will want to do this as soon as possible. The new book published in July 2018, and courses and exams are available to book now. Logic4training offers a full 18th Edition Wiring Regulation Course and a top up option to upgrade from 17th Edition to 18th Edition.